New Delhi: The Union government is in a fix over whether to go ahead and scrap the no-fail policy in schools after at least six states, most of them ruled by the Bharatiya Janata Party (BJP) or its allies, said they want the policy to remain, despite a majority of the states opposing it. Over the last few months, at least 27 states and Union territories have written to the human resource development (HRD) ministry arguing their case. “Of the 27 states, at least 21 are in favour of scrapping the policy. But the difficulty is those who are supporting the no-fail policy are largely BJP-ruled states,” said an HRD ministry official, who declined to be named. The no-fail policy came into force from 1 April 2014 after the Right to Education Act was implemented. The provision entails that no children in the 6-14 age group can be held back in any class up to Class VIII. It means all students get automatically promoted to the next level irrespective of their performance, leading to criticism that it is causing “accumulation of poor learning”. According to a ministry note, BJP-ruled Maharashtra and Goa, and Telugu Desam Party (TDP)-governed Andhra Pradesh have written to the HRD ministry supporting the no-fail policy. Chhattisgarh, also administered by the BJP, wants an exam only at Class VIII level and not before. TDP is a member of the BJP-led National Democratic Alliance (NDA). Other than the above four, Karnataka and Telegana too have supported the existing policy. “No detention policy should continue in the interest of the elementary education of all children,” Goa has written. 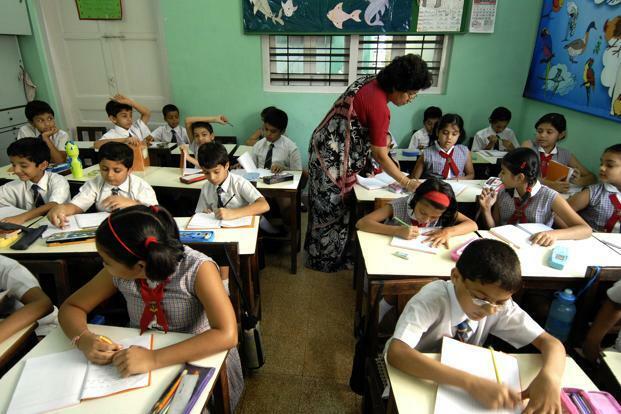 “No-detention policy should continue as it has reduced school dropout rate…and helps in building self-esteem (of children),” Maharashtra has written, according to the ministry note, a copy of which has been reviewed by Mint. Some six million children of school-going age are not enrolled in India, nearly half the numbers five years back. The Andhra Pradesh government, while supporting the no-fail policy has written, that its abolition will “lead to rote learning and undue fear of exams on the students and encourage malpractice and suppress analytical ability…” Instead, it has advised introducing assessments in Classes III, V and VIII—a view Karnataka has largely echoed. But the ministry official cited above said that at least three committees have received adverse feedback on the no-detention policy from students, parents and a section of teachers. The official the internal findings and the concerns of a majority of states point to a review of the policy. “In the absence of any scrutiny of bad performance, students and teachers are not very serious in parts of the country. The learning outcome has got impacted,” said the official. The apprehensions are not out of place. The Annual Status of Education Report (ASER) by education non-profit Pratham has found that despite the RTE, educational outcomes have not improved, and in fact worsened. The 2010 ASER found that only 53.4% of Class V students could read a Class II level text. “The HRD ministry has to walk carefully to avoid a political embarrassment if it directly overrules the points of BJP-ruled states favouring the no-fail policy,” the HRD ministry official added. “The possible solution is the RTE will be amended and a clause will be inserted to allow states to modify it suitably, but that will happen after the HRD minister Prakash Javadekar meets the state education ministers on this Tuesday,” said another government official with knowledge of the development.